The tapas menu is not confined to Spanish cuisine. In fact it seems to draw its influences from Asia as much as from Europe. Perched on the corner of Latrobe and Given Terraces, Simpatico is ideal for a relaxed Friday night dinner with drinks. Its discreet location and hospitable atmosphere make for a pleasant contrast to some of its fellow Paddington establishments (which are liable to get a bit too rowdy for some tastes). The place itself is pretty cosy, with a small bar area sectioned off from the equally small dining area by glass sliding doors. The fit-out is very simple and the food is similarly straightforward. Simpatico have gone the popular share plate route, and the only food they serve is tapas. Don’t be deceived however. Though there are a couple of more conventional items (like the whole chorizo with homemade tomato sauce), the menu is not confined to Spanish cuisine. In fact it seems to draw its influences from Asia as much as from Europe. The pulled pork tortillas with mixed herbs and sweet soy is an appetite whetting little number and the sticky chilli caramel pork belly with apple slaw is so tender, a knife is hardly necessary. Much of the food is quite hearty, even home-style, with slow-cooked beef rib with carrots and spinach, hand cut King Edward potatoes, and desserts that include a classic apple tart with cream along with old fashioned puddings. It would be remiss not to mention the Wednesday slow roast, which changes every week. Either just turn up and take pot luck or, if you want to hold out for a whole suckling pig (which we’re told does happen), ring ahead or check the website to find out what they’ll be cooking up that week. On our visit we were a bit surprised to find that some drinks were not available, especially as it was quite early on a Friday evening. That said there is a more than adequate selection of wines, fruity cocktails and imported and Australian boutique beers. 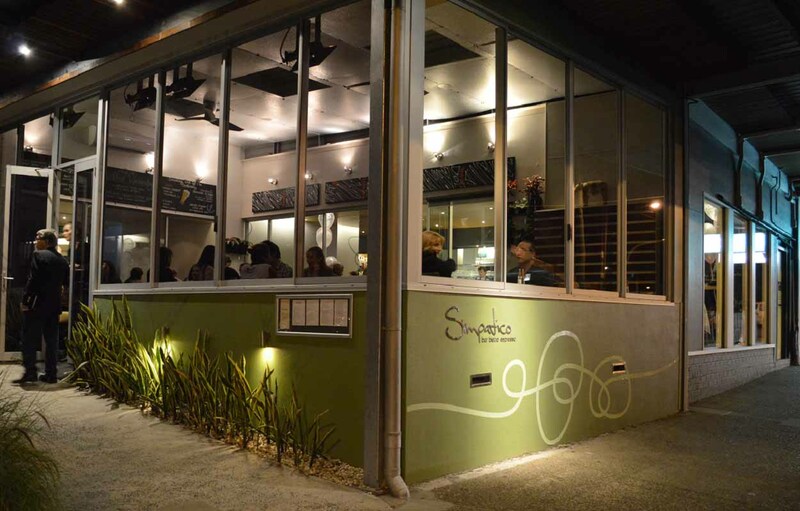 Simpatico appears to pull a more mature crowd, and it would be especially well-suited as a setting for a family get together or small function. It succeeds in providing an unfussy and congenial atmosphere, whether you’re looking for some satisfying food to complement a few drinks, or vice versa.